We're celebrating the season with some of our favorite Christmas movies. 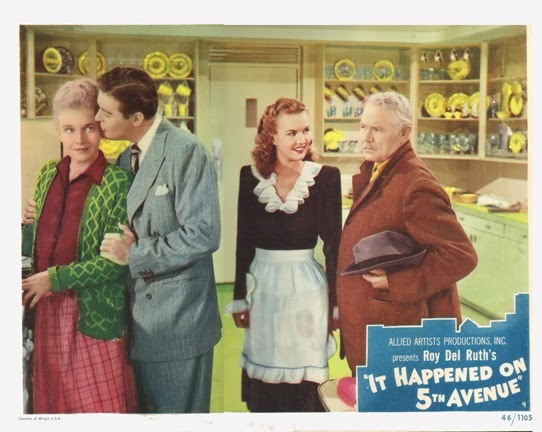 This week's selection is It Happened on 5th Avenue (1947), which is airing tonight (Dec. 4, 2015) on TCM. It Happened on 5th Avenue is a delightful holiday comedy that was forgotten for decades but has made a resurgence in recent years. The film begins with hobo Aloysius T. McKeever (Victor Moore) setting up winter quarters in the boarded-up Fifth Avenue mansion of "the second richest man in the world" Michael J. O'Connor (Charles Ruggles). For several years, McKeever has lived in the mansion -- wearing O'Connor's fancy clothes and eating his fine food--while O'Connor winters in Virginia. One day, The kindly McKeever meets a homeless ex-G.I. Jim Bullock (Don DeFore), and offers him a place to sleep. Soon several of Bullock's old army buddies, along with their wives and children, join McKeever and Bullock in the Manhattan manse. Gale Storm sings in It Happened on 5th Avenue (1947). Meanwhile, things aren't going so well at O'Connor's winter quarters. His wife (Ann Harding) has divorced him for neglecting her, and his 18-year-old daughter, Trudy (Gale Storm),gets tired of his all-consuming interest in business and runs back to New York. Trudy gets quite a surprise when she arrives at the Fifth Avenue mansion, but she persuades her parents --who have come to Manhattan to look for her-- to pretend they are homeless and move into the mansion under assumed names. She has fallen in love with Bullock and wants him to love her for herself and not her money. Hobo Aloysius T. McKeever and his dog lead the good life in It Happened on 5th Avenue (1947). The screenplay for It Happened on 5th Avenue was originally optioned by director Frank Capra, but he passed on it in favor of making It's a Wonderful Life. The script was then acquired by Allied Artists Pictures, which was a division of the B-movie studio Monogram Pictures. Monogram was notorious for being the cheapest of the cheapies, but they started Allied to make more prestige pictures. It Happened on 5th Avenue star Gale Storm autographed this poster from the 1947 film. Allied spent a great deal of money and attention on It Happened on 5th Avenue and it shows. The large sets are quite lavish and location shooting was done at several New York City sites to give the film an authentic feel (the footage was then projected behind the actors who were working on sound stages). Victor Moore (left), Gale Storm and Don DeFore stand behind a process shot of the Indian Hunter statue in Central Park. 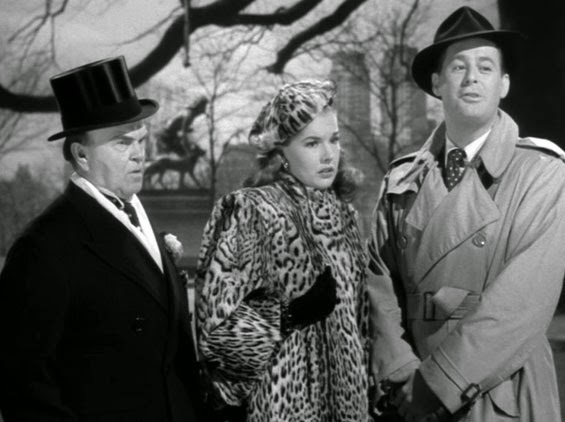 The cast of It Happened on 5th Avenue was also unusually strong for a B picture, featuring three of the best character actors in show business. 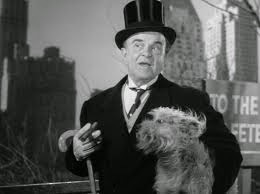 Victor Moore was a Broadway legend and his befuddled but lovable hobo in It Happened on 5th Avenue is closely related to his iconic turn on the Great White Way as befuddled but lovable Vice President Alexander Throttlebottom in Of Thee I Sing. Ex G.I. Jim Bullock (Don DeFore) gives socialite Trudy O'Connor (Gale Storm) shooting lessons in It Happened on 5th Avenue (1947). Charles Ruggles was one of the most prolific actors in old Hollywood, although he is probably best known today for his roles in screwball comedies. Ruggles gives a fine performance in It Happened on 5th Avenue, restraining his usual fussy mannerisms to play the role of a powerful man who is used to getting exactly what he wants but deep down longs for love and admiration. The luminous Ann Harding was a star of many weepy melodramas during the early thirties, but in this film, she is a haughty socialite who is only able to reveal her tender side when she is masquerading as a maid. 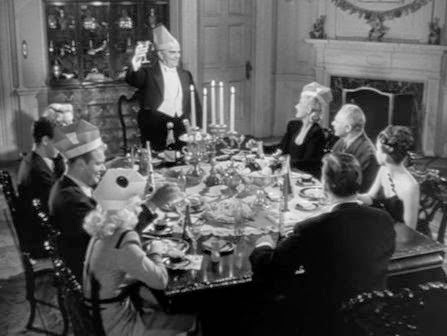 Hobo Aloysius T. McKeever (Victor Moore) toasts his houseguests in It Happened on 5th Avenue. 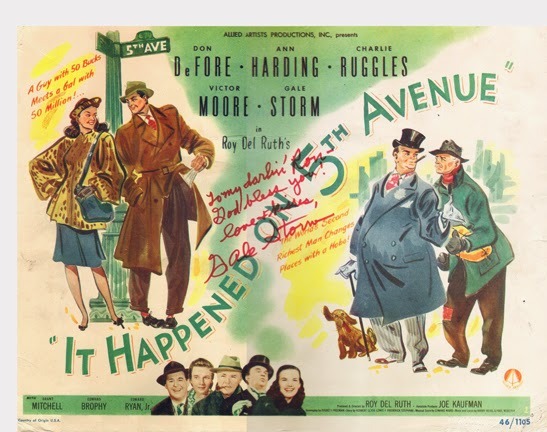 It Happened on 5th Avenue was a box-office and critical hit in 1947. 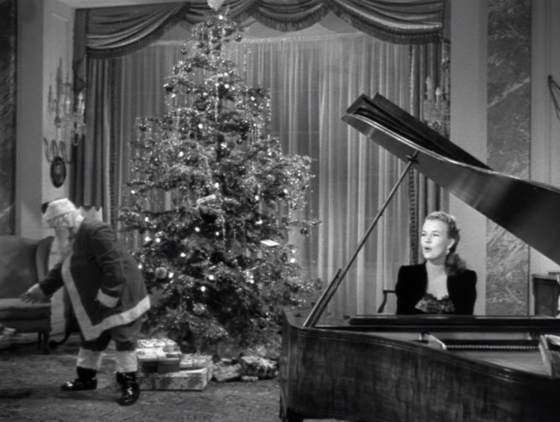 The film was nominated for Best Original Story but it lost to another 1947 Chrismas classic, Miracle on 34th Street. It Happened on 5th Avenue was overshadowed by It's a Wonderful Life through the years and the film largely faded into obscurity until the Internet came along and many people watched it on YouTube. Positive word of mouth spead and It Happened on 5th Avenue was released on DVD in 2008 and began appearing regularly on TCM and Hallmark channels. Thanks to the increased exposure, It Happened on 5th Avenue has taken its place alongside other treasured Christmas classics of old Hollywood. It Happened on 5th Avenue will air at 8 p.m. tonight (Dec. 4, 2015) on TCM and at 10 a.m. Dec. 20, 2015 on TCM. It is available on DVD and video on demand. It Happened on 5th Avenue is in the public domain so it is also available for viewing on media sharing sites like YouTube and the Internet Archive.